* Status: Active, members trying to avoid Team Kurenai, currently being led by Kakashi, while Guren is escorting Yukimaru to the lake inhabited by the Three-Tailed Beast. After Orochimaru had Kabuto fetch Guren, and the two returned to Orochimaru's current hideout, Guren was put in charge of having hundreds of test subjected prisoners battle each other to the death. After the majority of the prisoners kill each other, Guren stops the battle to make them her henchmen. When most of them decided to kill her and escape Orochimaru, Guren, without hesitation, kills them instantly with her crystal jutsu. The remaining henchmen, Rinji, Gozu, Kigiri, Kiho and Nurari, instantly decided to follow her without question. 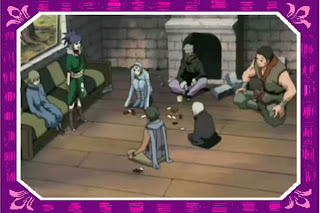 After they jioned her, Guren left the members at strange ruins as she escorted Yukimaru the Spirit Lake. Not long after, members Rinji and Gozu discover Kakashi and Team Kurenai following them.